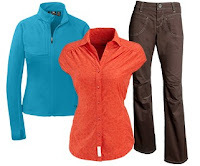 The other day, as part of their 10 Days of Deals promo, REI took 30% OFF all men's clothing and outerwear. I predicted the ladies would be next. Today is that day. So get an extra 30% OFF already discounted apparel through midnight Thursday. We're talking about hundreds of styles from such designers as Patagonia and Columbia that are already up to 50% OFF, and that's before the added markdown. Click here to go to the promotion at REI, then click Shop Today's Deal to see the savings.